This page contains information and pictures about Weevils that we found in the Brisbane area, Queensland, Australia. 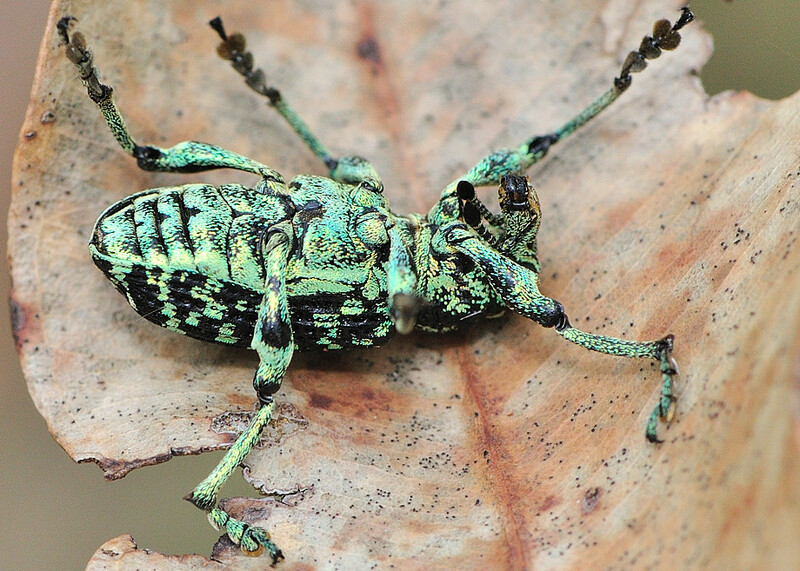 The beetles in this family are commonly called Weevil or True Weevil. The adults characterized by the elongated rostrum, the front part of their head and mouth, which they use to chew holes in plants for food and to make egg chambers. Their antennae usually elbowed and clubbed. They usually have rigid bodies. They are from small to very large size. Most of them are less than 10mm, although the largest can be up to 60mm. When disturbed, weevils usually drop onto the ground and play death. After a minutes without further disturb, it will slowly walk away. Both adults and larvae are plant feeders. Adults usually found on leaves. Larvae can be found in soil near roots, rotting wood or in stem. The classification of Curculionidae is very confusing. We sometimes found classification problems and our rule is - follow the Australian Faunal Directory. This is not working in Curculionidae for it is still blank under Curculionidae in Australian Faunal Directory. We largely follow Zimmerman here in the Curculionidae classification. Some References put this group as subfamily Brachycerinae. Adults of this subfamily are characterized by having a relatively short and stout rostrum, boarder at the tip. They are from moderate to large size. The larvae usually live in soil and feed on root. Weevils in this subfamily are medium size. They usually have the parallel cylindrical body. Their rostrum is medium length. We only found on species in this group. The weevil has extremely elongated body. It is brown in colour with a creamy-white pattern on each side of wings cover. We found a few species in this subfamily all are in genus Gonipterus. They are commonly know as Gum Nut Weevils. Those weevils usually sit next to gum nuts and camouflaged as one of them. The larvae of this subfamily are usually slug-like and external foliage-feeding. Some References put this group as subfamily Curculioninae. Subfamily Molytinae - This is a large subfamily. Members are usually have relatively long legs and long rostrum. This is a large subfamily. Members are usually have relatively long legs and with a long backwardly directed rostrum. Weevils in this group are from small to large in size. They have long and cylindrical rostrum with round eyes. 6. Curculionidae Latreille, 1802 - Australian National Insect Collection Database - CSIRO, 2011. 7. Family CURCULIONIDAE - Australian Faunal Directory, Australian Biological Resources Study. 8. Australian Weevils - Zimmerman, E.C., CSIRO PUBLISHING, 1991, Plate 425.